The above note is from the pages of ‘Karnataka History’ focusing on Nalwadi Krishnaraja Wadiyar, the Philosopher- King. Exactly 100 years later, true to the resolve of the then government, a school in the heart of the city with a very endearing name ‘Gadichowka Government School’ in Lakshmipuram close to the famous landmark Nanjumalige, is celebrating its centenary tomorrow (Nov.24). This school has a vast area, but there is also a Block Education Office here, because, a school at one time which was overflowing with students today is reduced to just a few students. The number of students in this school that has classes from one to seven is hardly 30 and with two Anganwadi centres also running here each with 25 children, the activity is just about picking up. There are only three teachers here including the Head Master S. Ravikumar, and the two teachers Mahadevamma and Harun Pasha. None of them are really excited about the fact that their school set up during the reign of Nalwadi is celebrating the centenary. The reason is simple — Not that they are not aware of the importance of the occasion, but simply because the teachers have a lot more on hand to do than just think about the celebrations. “Sixty-five per cent of our time is spent in attending to other work like being involved in election duty, voter ID, sending SMS to the office about how many students are absent, the weight of the children and only 35 per cent in teaching. Sadly even the Inspectors of Schools who were at one time more interested in knowing directly from the students what they have learnt today just do not bother about the students but instead ask the school teachers and Head Master and what they say they record and leave,” said one of the teachers who did not wish to be named and the other two echoed the thoughts. 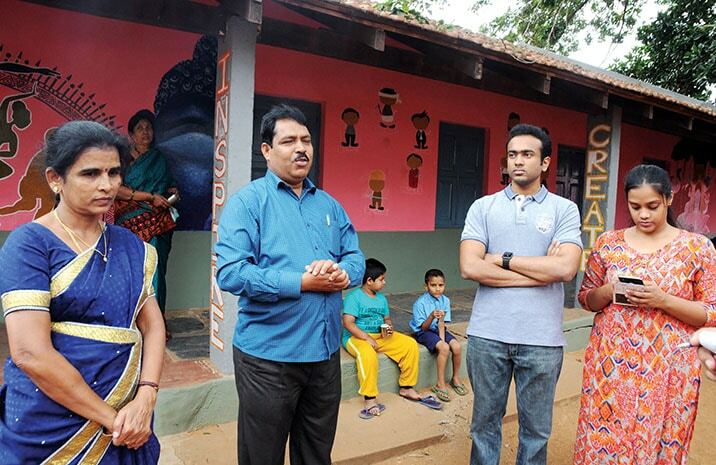 Pasha, like his counterparts in Harohalli village in Nanjangud where the teachers pooled in their own money to paint the school in the form of a train to attract more students, reveals that they have spent money out of their pockets to bring students in autorickshaws to the school. Asked why they should spend money out of their pockets, it was clear that they were forced to do this for two reasons — one noble, because most of the government school teachers feel that because they are getting a decent salary they want to see that they get the deprived sections of the society also get good education. While the other reason is a bit sad because they have the fear that if the students dropout then like many government schools in the State this will also close down. Here is where the role of Reachout India, a youth-run NGO working in the interest of the Government School, has made a difference as it has adopted Gadichowka Government School just three months ago. Sujay Shivapooja and his cousin Brinda Shivapooja, told Star of Mysore that Reachout India was started by Manasa Rao in Pune three years ago and now with another member Ishraq Faizal, the four of them are involved in giving a facelift to the school. As part of Project RISE, Reachout has collaborated with this government school to conduct English Learning Programmes. Teachers Mahadevamma and Harun Pasha seen with Sujay Shivapooja and Brinda Shivapooja of Reachout India NGO. 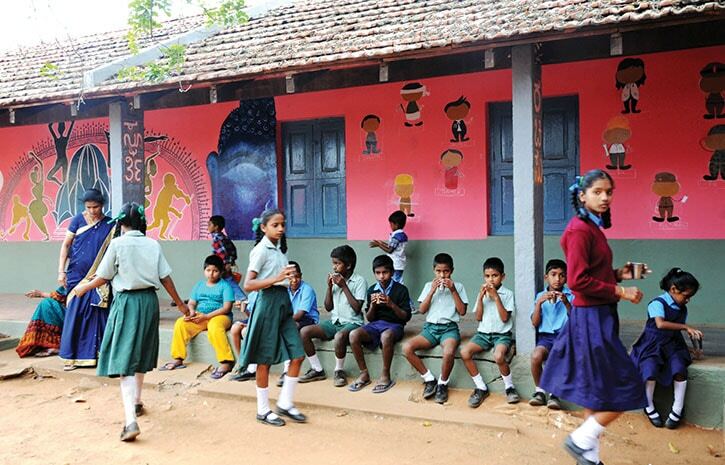 The classrooms and the walls have been painted by artists Inchara Somesh and architect Shivani Satish which makes the school a cheerful place. 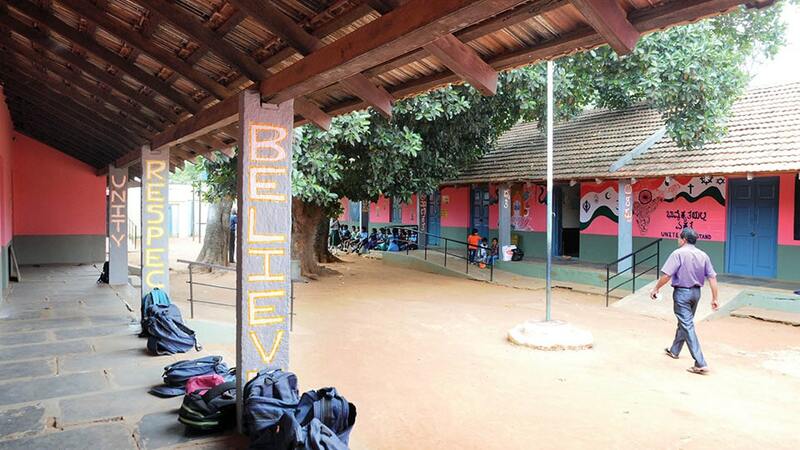 “It is only because of the involvement of NGOs like Reachout that we are able to run this school more efficiently. They have not only taken steps to control rodent problems, and given the school a facelift, we have also got help from donors who have given school bags freely,” said a smiling Head Master Ravikumar. They have plans to start LKG and UKG classes from next year so that they can retain the students in the school. “It is very sad that though we have two Anganwadis here, the parents prefer to send their children to a ‘Convent’ school simply because they are taught English there. Hence, we are also starting English medium here and since Reachout aims to start English language and moral education classes, we hope to enrol more students from next year,” said Pasha. Let us hope that more children join this 100-year-old School and also the Government stands firm in its resolve to improve such schools just like Nalwadi stood firm a century ago to improve school enrolment involving all sections of the society.